Iron deficiency anemia develops when body stores of iron drop too low to support normal red blood cell (RBC) production. Inadequate dietary iron, impaired iron absorption, bleeding, or loss of body iron in the urine may be the cause. Iron equilibrium in the body normally is regulated carefully to ensure that sufficient iron is absorbed in order to compensate for body losses of iron (see the image below). For patient education resources, see the Blood and Lymphatic System Center and the Esophagus, Stomach, and Intestine Center, as well as Anemia and Celiac Sprue. Iron deficiency is defined as a decreased total iron body content. Iron deficiency anemia occurs when iron deficiency is severe enough to diminish erythropoiesis and cause the development of anemia. Iron deficiency is the most prevalent single deficiency state on a worldwide basis. It is important economically because it diminishes the capability of individuals who are affected to perform physical labor, and it diminishes both growth and learning in children. Posthemorrhagic anemia is discussed in this article because it is an important cause of iron deficiency. The acute and potentially catastrophic problems of hypoxia and shock that can occur from significant hemorrhage or severe iron deficiency are discussed elsewhere; however, daily blood losses can be small and may be overlooked. Occasionally, patients with severe iron deficiency anemia from slow but persistent gastrointestinal (GI) bleeding have repeatedly negative testing of stool for hemoglobin. Therefore, it is important for the clinician to be aware of characteristics of the anemia at all intervals after the onset of bleeding. Go to Anemia, Sideroblastic Anemias, and Chronic Anemia for complete information on these topics. Iron is vital for all living organisms because it is essential for multiple metabolic processes, including oxygen transport, DNA synthesis, and electron transport. 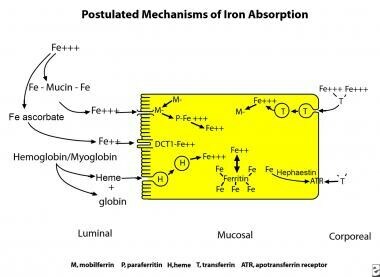 Iron equilibrium in the body is regulated carefully to ensure that sufficient iron is absorbed in order to compensate for body losses of iron (see the image below). Whereas body loss of iron quantitatively is as important as absorption in terms of maintaining iron equilibrium, it is a more passive process than absorption. 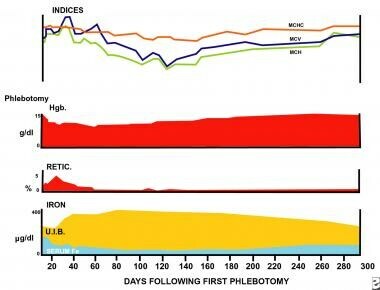 In healthy people, the body concentration of iron (approximately 60 parts per million [ppm]) is regulated carefully by absorptive cells in the proximal small intestine, which alter iron absorption to match body losses of iron (see the image below). Persistent errors in iron balance lead to either iron deficiency anemia or hemosiderosis. Both are disorders with potential adverse consequences. Either diminished absorbable dietary iron or excessive loss of body iron can cause iron deficiency. Diminished absorption usually is due to an insufficient intake of dietary iron in an absorbable form. Hemorrhage is the most common cause of excessive loss of body iron, but it can occur with hemoglobinuria from intravascular hemolysis. Malabsorption of iron is relatively uncommon in the absence of small bowel disease (sprue, celiac disease, regional enteritis) or previous GI surgery. 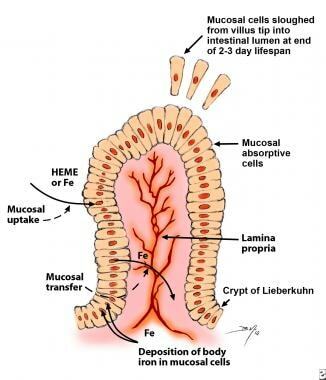 Iron uptake in the proximal small bowel occurs by 3 separate pathways (see the image below). 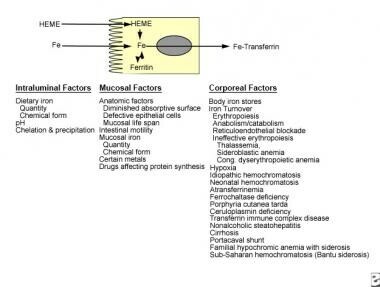 These are the heme pathway and 2 distinct pathways for ferric and ferrous iron. In North America and Europe, one third of dietary iron is heme iron, but two thirds of body iron is derived from dietary myoglobin and hemoglobin. Heme iron is not chelated and precipitated by numerous dietary constituent that render nonheme iron nonabsorbable (see the image below), such as phytates, phosphates, tannates, oxalates, and carbonates. Heme is maintained soluble and available for absorption by globin degradation products produced by pancreatic enzymes. Heme iron and nonheme iron are absorbed into the enterocyte noncompetitively. Heme enters the cell as an intact metalloporphyrin, presumably by a vesicular mechanism. It is degraded within the enterocyte by heme oxygenase with release of iron so that it traverses the basolateral cell membrane in competition with nonheme iron to bind transferrin in the plasma. Ferric iron utilizes a different pathway to enter cells than ferrous iron. This was shown by competitive inhibition studies, the use of blocking antibodies against divalent metal transporter-1 (DMT-1) and beta3-integrin, and transfection experiments using DMT-1 DNA. This research indicated that ferric iron utilizes beta3-integrin and mobilferrin, while ferrous iron uses DMT-1 to enter cells. Which pathway transports most nonheme iron in humans is not known. Most nonheme dietary iron is ferric iron. Iron absorption in mice and rats may involve more ferrous iron because they excrete moderate quantities of ascorbate in intestinal secretions. Humans, however, are a scorbutic species and are unable to synthesize ascorbate to reduce ferric iron. The iron concentration within enterocytes varies directly with the body’s requirement for iron. Absorptive cells of iron-deficient humans and animals contain little stainable iron, whereas those of subjects who are replete in iron contain significantly higher amounts. Untreated phenotypic hemochromatosis creates little stainable iron in the enterocyte, similar to iron deficiency. Iron within the enterocyte may operate by up-regulation of a receptor, saturation of an iron-binding protein, or both. In contrast to findings in iron deficiency, enhanced erythropoiesis, or hypoxia, endotoxin rapidly diminishes iron absorption without altering enterocyte iron concentration. This suggests that endotoxin and, perhaps, cytokines alter iron absorption by a different mechanism. This is the effect of hepcidin and the balance of hepcidin versus erythropoietin. Most iron delivered to nonintestinal cells is bound to transferrin. Transferrin iron is delivered into nonintestinal cells via 2 pathways: the classical transferrin receptor pathway (high affinity, low capacity) and the pathway independent of the transferrin receptor (low affinity, high capacity). Otherwise, the nonsaturability of transferrin binding to cells cannot be explained. In the classical transferrin pathway, the transferrin iron complex enters the cell within an endosome. Acidification of the endosome releases the iron from transferrin so that it can enter the cell. The apotransferrin is delivered by the endosome to the plasma for reutilization. The method by which the transferrin receptor–independent pathway delivers iron to the cell is not known. Nonintestinal cells also possess the mobilferrin integrin and DMT-1 pathways. Their function in the absence of an iron-saturated transferrin is uncertain; however, their presence in nonintestinal cells suggests that they may participate in intracellular functions in addition to their capability to facilitate cellular uptake of iron. Meat provides a source of heme iron, which is less affected by the dietary constituents that markedly diminish bioavailability than nonheme iron is. The prevalence of iron deficiency anemia is lower in geographic areas where meat is an important constituent of the diet. In areas where meat is sparse, iron deficiency is commonplace. Substances that diminish the absorption of ferrous and ferric iron include phytates, oxalates, phosphates, carbonates, and tannates (see the image below). These substances have little effect upon the absorption of heme iron. Similarly, ascorbic acid increases the absorption of ferric and ferrous iron and has little effect upon the absorption of heme iron. Purified heme is absorbed poorly because heme polymerizes into macromolecules. Globin degradation products diminish heme polymerization, making it more available for absorption. They also increase the absorption of nonheme iron because the peptides from degraded globin bind the iron to prevent both precipitation and polymerization; thus, absorption of the iron in spinach is increased when the spinach eaten with meat. Heme and nonheme iron uptake by intestinal absorptive cells is noncompetitive. Bleeding for any reason produces iron depletion. If sufficient blood loss occurs, iron deficiency anemia ensues (see the image below). A single sudden loss of blood produces a posthemorrhagic anemia that is normocytic. The bone marrow is stimulated to increase production of hemoglobin, thereby depleting iron in body stores. Once they are depleted, hemoglobin synthesis is impaired and microcytic hypochromic erythrocytes are produced. 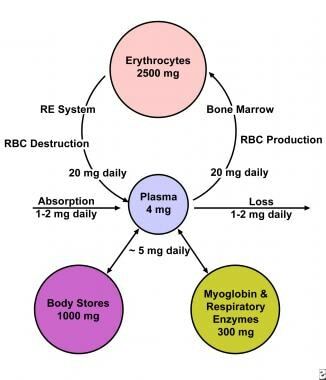 Maximal changes in the red blood cell (RBC) cellular indices occur in approximately 120 days, at a time when all normal erythrocytes produced prior to the hemorrhage are replaced by microcytes. Before this time, the peripheral smear shows a dimorphic population of erythrocytes, normocytic cells produced before bleeding, and microcytic cells produced after bleeding. This is reflected in the red blood cell distribution width (RDW); thus, the earliest evidence of the development of an iron-deficient erythropoiesis is seen in the peripheral smear, in the form of increased RDW. Iron deficiency anemia can occur from loss of body iron in the urine. If a freshly obtained urine specimen appears bloody but contains no red blood cells, suspect hemoglobinuria. Obtain confirmation in the laboratory that the pigment is hemoglobin and not myoglobin. This can be accomplished easily because 60% ammonium sulfate precipitates hemoglobin but not myoglobin. Hemoglobinuria classically is ascribed to paroxysmal nocturnal hemoglobinuria, but it can occur with any brisk intravascular hemolytic anemia. In the early days of heart surgery with implantation of artificial valves, this mechanism of producing iron deficiency anemia was commonplace in large university hospitals. Today, with better prostheses, it has become a less frequent clinical problem. With less severe hemolytic disorders, there may be no significant hemoglobinuria. Investigate renal loss of iron by staining the urine sediment for iron. Hemosiderin is detected intracellularly. Most of these patients have a low or absent plasma haptoglobin. Similarly, pulmonary hemosiderosis can result in sufficient loss of iron as hemosiderin from the lungs. Prolonged achlorhydria may produce iron deficiency because acidic conditions are required to release ferric iron from food. Then, it can be chelated with mucins and other substances (eg, amino acids, sugars, amino acids, or amides) to keep it soluble and available for absorption in the more alkaline duodenum. Starch and clay eating produce malabsorption of iron and iron deficiency anemia. Specific inquiry is required to elicit a history of either starch or clay eating because patients do not volunteer the information. Extensive surgical removal of the proximal small bowel or chronic diseases (eg, untreated sprue or celiac syndrome) can diminish iron absorption. Rarely, patients with no history of malabsorption have iron deficiency anemia and fail to respond to oral iron therapy. Most merely are noncompliant with therapy. Before placing these patients on parenteral therapy, document iron malabsorption either by measuring absorption of radioiron or by obtaining a baseline fasting serum-iron concentration and repeating the test 30 minutes and 1 hour after administration of a freshly prepared oral solution of ferrous sulfate (50-60 mg of iron) under observation. The serum iron should increase by 50% over the fasting specimen. Iron-refractory iron deficiency anemia (IRIDA) is a hereditary disorder marked by with iron deficiency anemia that is typically unresponsive to oral iron supplementation and may be only partially responsive to parenteral iron therapy. IRIDA results from variants in the TMPRSS6 gene that lead to uninhibited production of hepcidin. IRIDA is characterized by microcytic, hypochromic anemia and serum hepcidin values that are inappropriately high for body iron levels. In North America and Europe, iron deficiency is most common in women of childbearing age and as a manifestation of hemorrhage. Iron deficiency caused solely by diet is uncommon in adults in countries where meat is an important part of the diet. Depending upon the criteria used for the diagnosis of iron deficiency, approximately 4-8% of premenopausal women are iron deficient. In men and postmenopausal women, iron deficiency is uncommon in the absence of bleeding. In certain geographic areas, intestinal parasites, particularly hookworm, worsen the iron deficiency because of blood loss from the GI tract. Anemia is more profound among children and premenopausal women in these environs. Healthy newborn infants have a total body iron of 250 mg (80 ppm), which is obtained from maternal sources. This decreases to approximately 60 ppm in the first 6 months of life, while the baby consumes an iron-deficient milk diet. Infants consuming cow milk have a greater incidence of iron deficiency because bovine milk has a higher concentration of calcium, which competes with iron for absorption. Subsequently, growing children must obtain approximately 0.5 mg more iron daily than is lost in order to maintain a normal body concentration of 60 ppm. During adult life, equilibrium between body loss and gain is maintained. Children are more likely to develop iron deficiency anemia. In certain geographic areas, hookworm adds to the problem. Children are more likely to walk in soil without shoes and develop heavy infestations. During childbearing years, women have a high incidence of iron deficiency anemia because of iron losses sustained with pregnancies and menses. Gastrointestinal neoplasms become increasingly more prevalent with each decade of life. They frequently present with GI bleeding that may remain occult for long intervals before it is detected. Usually, bleeding from neoplasms in other organs is not occult, prompting the patient to seek medical attention before developing severe iron depletion. Investigate the etiology of the iron deficiency anemia to evaluate for a neoplasm. An adult male absorbs and loses about 1 mg of iron from a diet containing 10-20 mg daily. During childbearing years, an adult female loses an average of 2 mg of iron daily and must absorb a similar quantity of iron in order to maintain equilibrium. Because the average woman eats less than the average man does, she must be more than twice as efficient in absorbing dietary iron in order to maintain equilibrium and avoid developing iron deficiency anemia. Healthy males lose body iron in sloughed epithelium, in secretions from the skin and gut lining, and from small daily losses of blood from the GI tract (0.7 mL daily). Cumulatively, this amounts to 1 mg of iron. Males with severe siderosis from blood transfusions can lose a maximum of 4 mg daily via these routes without additional blood loss. A woman loses about 500 mg of iron with each pregnancy. Menstrual losses are highly variable, ranging from 10 to 250 mL (4-100 mg of iron) per period. These iron losses in women double their need to absorb iron in comparison to males. A special effort should be made to identify and treat iron deficiency during pregnancy and early childhood because of the effects of severe iron deficiency upon learning capability, growth, and development. Race probably has no significant effect upon the occurrence of iron deficiency anemia; however, because diet and socioeconomic factors play a role in the prevalence of iron deficiency, it more frequently is observed in people of various racial backgrounds living in poorer areas of the world.